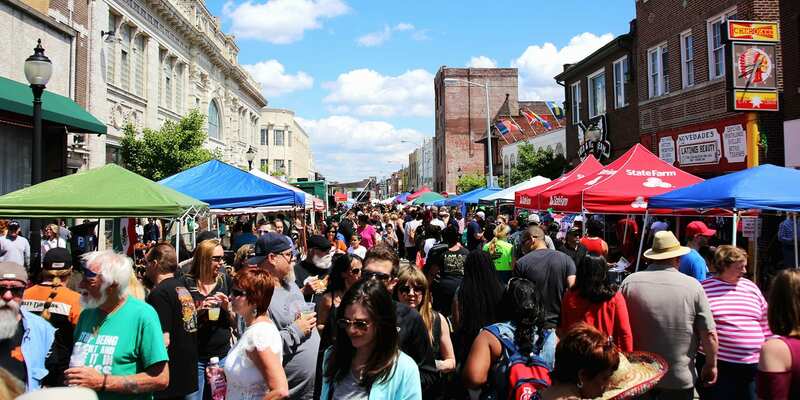 Saturday, May 5th, is the annual Cinco de Mayo Festival on Cherokee Street from Nebraska to Jefferson. Enjoy food and drink, live music on three stages, dance, children’s activities, Lucha Libre Wrestling, and more. The People’s Joy Parade, featuring homemade costumes and floats, begins at 1:11pm at Cherokee and Minnesota and winds its way through the neighborhood to Cherokee and Texas. 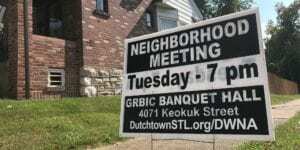 Gravois Park and Dutchtown West both hold their regular meetings on Tuesday, May 8th. Gravois Park meets at 6pm at 3353 California (just north of Cherokee in the old Jefferson Bank building). Dutchtown West meets at 7pm at the banquet hall at Grbic Restaurant. The Cherokee Street Business Association meets Thursday, May 17th, 5:30pm at Nebula. Business owners, property owners, and residents are all encouraged to attend. Mount Pleasant has their quarterly meeting this month. They will meet on Wednesday, May 30th at 7pm at the Gretchen Inn at the Feasting Fox. Come to Thomas Dunn Learning Center on Thursday morning, May 3rd for What’s Brewing? Arts and Culture in Dutchtown Neighborhood Revitalization, a conversation exploring arts and culture in community development. The event is free but registration is required. On Thursday, May 10th, Thomas Dunn will host a reception and exhibition for Artists First STL, an open studio that fosters independence through self-expression for artists of all abilities. Also, now is the time to sign up for free summer day camps for youths at Thomas Dunn. Camps include ceramics, cooking, leadership, and coding. The City of St. Louis also offers additional free camps at Thomas Dunn and other locations in the neighborhood and across the city. As always, Thomas Dunn Learning Center offers open art and computer labs, HiSET GED classes, parenting education, and other services. Check out their calendar for dates and times. DSCC begins their series of landlord workshops on Wednesday, May 9th, 6pm at Thomas Dunn Learning Center. This first meeting focuses on basic financial management. Meetings in June and July will cover fair housing issues, tenants’ rights, and energy efficient and eco-friendly rehab construction. The Community Empowerment Committee meets on Wednesday, May 30th, 6pm at Thomas Dunn Learning Center. Dinner and childcare are provided. Habitat for Humanity St. Louis opens their new headquarters and ReStore on Tuesday, May 1st at Grand and Chippewa in the former National building. The ReStore is open to the public and features nearly 20,000 square feet of new or reusable construction and remodeling materials. 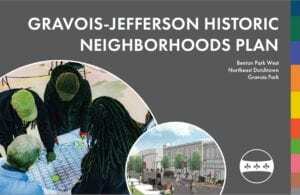 The Gravois-Jefferson Historic Neighborhoods Plan will be considered for adoption by the St. Louis Planning Commission on May 2nd. Find out more about the plan and how to submit feedback at this link. Flow Yoga and Art at 3137 Meramec is hosting their first Yoga and Salad Session on Wednesday, May 2nd at 6:30pm. Start with an hour long yoga class for all levels, then enjoy vegan salads and other healthy refreshments. 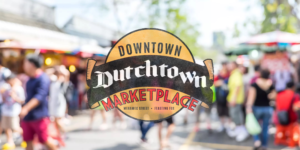 The Downtown Dutchtown Marketplace continues every Saturday, from 9am to 3pm. The Marketplace starts at the Feasting Fox and continues down Meramec. 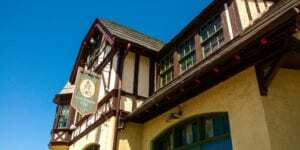 Find antiques, art, collectibles, a farmers market, and more. 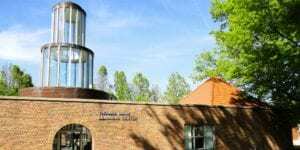 The Dutchtown Community Improvement District hold their regular committee and board meetings throughout the month. Committees include Beautification and Maintenance, Marketing and Development, and Safety and Security. Meet with the committee that suits your interests or attend a board meeting to see how it all comes together. The Feasting Fox celebrates Gin Week May 7th through May 12th with tastings and discussions with distillers. The South City Sipsters will meet during Gin Week on Thursday, May 10th, and will get to sample and learn about gin in addition to the usual beer and wine. The Feasting Fox will also be offering a special Mother’s Day Brunch including an all-you-can-eat buffet (reservations are required). The Cherokee Street Community Market at Love Bank Park begins Wednesday, May 9th at 4:30pm and will pop up once a month through October. The market features fresh produce, hot food, art, and entertainment. The Downtown Dutchtown Business Association‘s monthly DT2 After Hours will be hosted by Queen’s Nail Salon at 3315 Meramec. Come by to meet the new neighbors, enjoy some refreshments, and get a quick mani/pedi. The first annual Cherokee Caravan Antiques and Art Bazaar is on Memorial Day along Cherokee Antique Row. The Bazaar will feature local and out-of-town antique vendors and makers as well as food trucks and live entertainment. As always, make sure to check our calendar regularly, sign up for our mailing list, and follow us on Facebook, Twitter, and Instagram. If you have an event in Dutchtown, Gravois Park, Mount Pleasant, Marine Villa, or Cherokee Street that you’d like us to share, please contact us or email info@dtstl.org. Top photo courtesy of Paul Sableman. This post was updated on May 1, 2018 . Read more news about Cherokee Street, Classes, Cleanups, DT2, Dutchtown, Dutchtown CID, Dutchtown Events, Dutchtown South Community Corporation, Dutchtown West, Festivals, Gravois Park, Gravois-Jefferson Historic Neighborhoods Plan, Marine Villa, Meetings, Mount Pleasant, So Fresh So Clean So Creative, and Thomas Dunn Learning Center.